We open in 1919, at the tail end of WWI, and the so-called Medici Brothers’ Circus—it actually only has one owner, Max Medici (Danny DeVito)—has fallen on hard times. No sooner has former frontman Holt Farrier (Colin Farrell) returned from the war—minus an arm—and back to his children Milly and Joe (Nico Parker and Finley Hobbins) then he finds his wife has died in the Spanish Flu epidemic and the cash-strapped Max has sold the prize stallions that made up Holt’s act. But Max thinks he’s found salvation: a pregnant elephant, “Mrs. Jumbo”, ready to give birth. But when the baby emerges, it’s an anomaly with ears so outsized it trips over them. Max is disapppointed, and the baby quickly gains the nickname “Dumbo”. But then the kids discover that Dumbo’s ears are good for more than tripping over: this elephant can fly. It’s not long before the Medici Circus’ new sensation has attracted the attention of V.A. Vandevere (Michael Keaton at his hammiest), who arrives with his “discovery”, French high-flying acrobat Colette Blanchard (Eva Green), in tow to sweep the struggling Medici “family” off their feet with flowery promises of a new home in his lavish, big-leagues Coney Island amusement park Dreamland. It’s pretty obvious to the audience—even if not to the naive characters—that all Vandevere is really interested in is Dumbo, and it’s not long before the long-suffering Medici crew finds themselves kicked to the curb and eventually staging a rescue plan. Unlike Bill Condon’s Beauty and the Beast, Burton at least tries to do something a little different from a straight-up scene-by-scene regurgitation of the original; this version adds an extra fifty minutes to the original’s slim 64-minute runtime. There’s no talking animals, human characters have much more prominent roles to compensate, and there’s no full musical numbers, although the infamously tear-jerking “Baby Mine” makes it in, sung by a different character but in similar context (and is reprised over the end credits). Alas, the added padding is a mixed bag. The first half hour or so is a slog, focusing on the family dynamic of the dull Farrier family which is neither moving nor interesting because it feels like a paint-by-numbers retread of similar material we’ve seen a hundred times before: the generically plucky kids estranged from their generically surly dad, who will be brought back together as a big happy family, to the surprise of absolutely no one in the audience. At no point in time does the movie take any risks or do anything surprising, and all of the characters are one-note; everyone good-hearted with the exception of V.A. Vandevere, who’s cartoonishly evil. It says something that the most affecting scene in the movie involves none of the uninteresting human characters, but is the most directly regurgitated scene from the original, the separation of Dumbo from his mother, even set to the tune of “Baby Mine”. Things get more interesting when our villain V.A. Vandevere and his amusement park Dreamland shows up. V.A. Vanedevere is the most colorful character, recalling an amalgamation of P.T. Barnum at his most hucksterish and an evil Walt Disney (between the comically terrible hairdo, the questionable financing, the eye candy on his arm, and the overall one-dimensional villainy, there might be slight shades of Donald Trump in the mix too). He resides in a sleek ultra-modern office that looks like it’d be home to Lex Luthor (from wherein he summons minions to issue pronouncements like “cancel my dinner with the President….I have business with an elephant”), he threatens to kill a baby elephant’s mother, and he’s got a creepy henchman (Joseph Gatt). His lavish amusement park Dreamland bears a suspicious resemblance to none other than Disneyland; is it reading too much subtext into it to see parallels with some of Disney’s own predatory business practices toward the companies it devours, and the way Vandevere treats the Medici “family”? Perhaps, but at least a fleeting resemblance between Vandevere and Disney is hard to deny, and it’s a small wonder Burton managed to get away with making a movie with Disney’s name all over it in which the villain recalls an evil Walt Disney. We climax with an enjoyable, if predictable, “prison break”. Dumbo‘s biggest asset (besides the cuteness of the title character) is Burton’s visual flair. Dumbo is a consistently good-looking film from start to finish, and Burton’s panache really kicks in around the midway point when we get to the garish, larger-than-life Dreamland, full of elaborate choreographed numbers and colorful costumes. We never get a proper tour, but Dreamland serves up plenty of background eye candy. While Dreamland has a dark side—“Nightmare Island”, featuring imprisoned dangerous animals—Burton doesn’t forget he’s making a family film, and tones himself down; his trademark eeriness is scarce to be found. Dumbo is unabashedly adorable—and in a conventional, straightforward way, not like Frankenweenie or Jack Skellington’s ghost dog—with his huge floppy ears and big blue eyes, and despite narratively playing second fiddle to the humans in this version, and not talking or singing, still manages to steal the show (not a hard feat when the human characters are this boring). The CGI is very good; movies with CGI animals like elephants tend to be unconvincing and break any sense of verisimilitude, but that’s not the case here. Apart from his huge flappy ears and exaggeratedly big blue eyes (making him cuter and more relatable), Dumbo is rendered with lifelike features, and regarding his mother, it’s hard to tell whether she’s CGI, the real thing, or a combination. Burtonites going to see Dumbo might be disappointed by how “safe” he plays it here. There’s a lot of visual flair and some Burton regulars (Eva Green, Michael Keaton, Danny DeVito), and Burton’s usual composer Danny Elfman, but not much of Burton’s distinctly weird fingerprints. With one or two exceptions, the human characters are bland and uninteresting, and their dullness makes parts of Dumbo, especially the opening half hour or so, a slog to sit through. Colin Farrell (playing his second struggling Disney patriarch after Saving Mr. Banks) has the thankless role of the generic surly estranged parent, and does nothing to enliven it; his Holt is dull and uncharismatic. The child actors, Nico Parker (who vaguely resembles her mother Thandie Newton) and Finley Hobbins are weak performers. Sitting through the scenes centering on the Farrier family when they’re all this dull is a bit of a chore. Danny DeVito brings a little more panache to the circus ringleader, but is basically cruising through on autopilot in Generic Danny DeVito mode (and feels watered-down by the family friendly rating). Only two human cast members make more impression. First is Eva Green, who is as always a striking presence, although her material doesn’t give her much to do, and certainly nothing anything nearly as juicy or femme fatale as her best roles. There’s seemingly meant to be some low-key budding romance between Colette and Holt, but it’s too thinly-developed to have any effect, and there’s no evident chemistry between Green and Farrell. The second is Michael Keaton, sporting odd vocal inflections and an intentionally (I think) awful wig and sinking his teeth into the cartoonishly dastardly V.A. Vandevere with the level of sneering and mustache-twirling you might find from a villain on a Saturday morning cartoon. It’s the kind of over-the-top hamfest I’m not sure is good acting or terrible acting, but unlike most other performances in the movie, it at least can’t be accused of being generic. Alan Arkin has a thankless walk-on role as Vandevere’s acerbic investor “J. Griffin Remington” (meant to recall J.P. Morgan?). 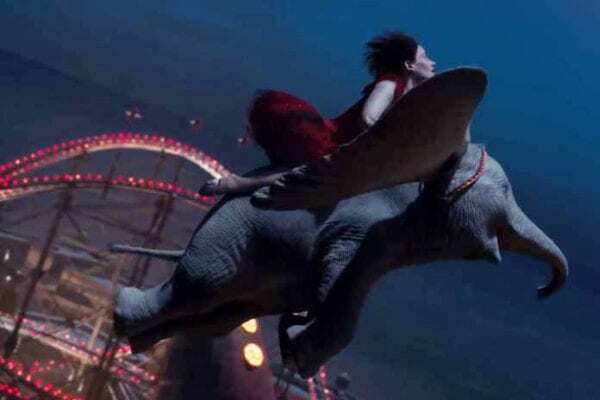 Dumbo at least serves up enough of its own identity to function as more of a reimagining than a straight regurgitation, but what it comes up with on its own is a mixed bag. It may delight children and give their parents something watchable rather than an endurance contest, but what it offers for adults attending on their own is limited.